The BRICS nations - Brazil, Russia, India, China, South Africa - on 16 October, adopted and signed the Goa Declaration that lays a comprehensive vision for our cooperation within BRICS and international issues. The main issue of the BRICS Goa summit 2016 was all about terrorism and how to fight and contain terrorism across the world. Along with the adoption, MoUs on agricultural research, co-operation between diplomatic academies and regulations on custom cooperation too were signed. Putting more emphasis on the declaration and the summit, Modi further added that he thinks through common vision and collective action, BRICS will create and sustain deeper bonds amongst each other. Concluding the BRICS summit PM Modi mentioned how they adopted the Goa Declaration that lays a comprehensive vision for cooperation within BRICS and international issues. Keeping the issue of terrorism in centre, Modi said,"We were unanimous in recognising the threat that terrorism, extremism and radicalisation presents." "We agreed those who nurture, shelter, support and sponsor forces of violence and terror are as much a threat to us as terrorists themselves." "We underscored the need for close coordination on tracking sources of terrorist financing and target the hardware of terrorism, including weapons' supplies, ammunition, equipment and training. BRICS is committed to strengthen our consultations and cooperation on peace and security matters," Modi said. Goa Declaration also mentions how the BRICS strongly condemn the recent several attacks, against some BRICS countries, including that in India - Uri attack. 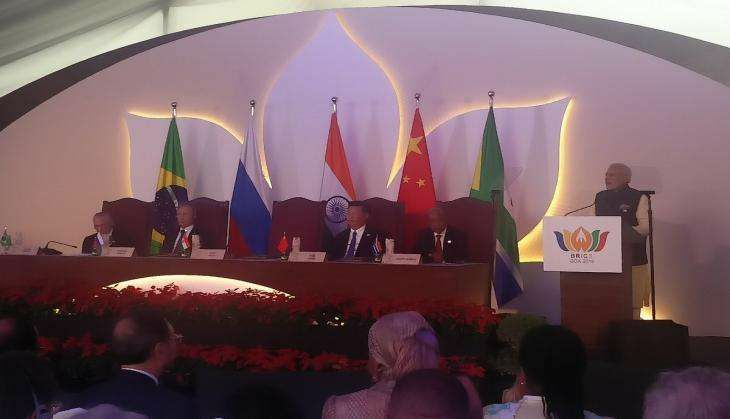 We, the Leaders of the Federative Republic of Brazil, the Russian Federation, the Republic of India, the People's Republic of China and the Republic of South Africa, met on 15-16 October 2016 in Goa, India, at the Eighth BRICS Summit, which was held under the theme "Building Responsive, Inclusive and Collective Solutions." We express deep concern at the persisting security challenges in Afghanistan and significant increase in terrorist activities in Afghanistan. We affirm support to the efforts of the Afghan Government to achieve Afghan-led and Afghan-owned national reconciliation and combat terrorism, and readiness for constructive cooperation in order to facilitate security in Afghanistan, promote its independent political and economic course, becoming free from terrorism and drug trafficking. The Leaders expressed the view that capable and effective Afghan National Security Forces (ANSF) should be the key to the stabilisation of Afghanistan. In this regard, the Leaders emphasised the need for continued commitment of regional countries and wider international community, including the NATO-led Resolute Support Mission, which as the ISAF's heir has a key role in the ANSF capacity-building. The Leaders stressed the importance of multilateral region-led interaction on Afghan issues, primarily by those organisations, which consist of Afghanistan's neighbouring countries and other regional states, such as the Shanghai Cooperation Organisation, Collective Security Treaty Organization, and the Heart of Asia Conference. We welcome the African Union's (AU) vision, aspirations, goals and priorities for Africa's development enshrined in Agenda 2063, which is complementary with the 2030 Agenda for Sustainable Development. We reaffirm our support for Africa's implementation of its variousprogrammesin pursuit of its continental agenda for peace and socio economic development. We will continue to engage in joint endeavours to advance Africa's solidarity, unity and strength through support measures for regional integration and sustainable development.We further welcome recent elections that have been held in the continent and the peaceful manner in which they were conducted. We support the AU's efforts to resolving conflictsthrough its peace and security architecture, in collaboration with the United Nations and the continent's regional organisations, and to contribute towards lasting and sustainable peace and security in Africa. We welcome the decision of the African Union's Assembly to operationalise its Peace Fund, in order to contribute to financing of its peace and security operations. We support efforts aimed at full operationalisation of the African Standby Force (ASF) and note the progress being made in this regard, including the contributions by the African Capacity for Immediate Responses to Crises (ACIRC). We commit to lead by example in the implementation of the 2030 Agenda for Sustainable Development inline with national circumstances and development context respecting the national policy space. We welcome the G20 Action Plan on the 2030 Agenda for Sustainable Development adopted during G20 Hangzhou Summit and commit to its implementation by taking bold transformative steps through both collective and individual concrete actions. We meet at a time when the global economic recovery is progressing, with improved resilience and emergence of new sources of growth.The growth, though is weaker than expected with downside risks to the global economy continuing to persist.This gets reflected in a variety of challenges including commodity price volatility, weak trade, high private and public indebtedness, inequality and lack of inclusiveness of economic growth. Meanwhile, the benefits from growth need to be shared broadly in an inclusive manner.Geopolitical conflicts, terrorism, refugee flows, illicit financial flows and the outcome of UK referendum have further added to the uncertainty in the global economy. We reiterate our determination to use all policy tools - monetary, fiscal, and structural, individually and collectively, to achieve the goal of strong, sustainable, balanced and inclusive growth. Monetary policy will continue to support economic activity and ensure price stability, consistent with central bank's mandates. Monetary policy alone, though, cannot lead to balanced and sustainable growth. We, in this regard, underscore the essential role of structural reforms.We emphasise that our fiscal policies are equally important to support our common growth objectives. We also take note that the spill-over effects ofc ertain policy measures in some systemically important advanced economies can have adverse impact on growth prospects of emerging economies. We appreciate the progress in the implementation of the Strategy for BRICS Economic Partnership and emphasise the importance of the BRICS Roadmap for Trade, Economic and Investment Cooperation until 2020. We believe that close cooperation between the sectoral cooperation mechanisms, BRICS Contact Group on Economic and Trade Issues, the BRICS Business Council, New Development Bank and the BRICS Interbank cooperation mechanism is crucial in strengthening the BRICS economic partnership. We welcome, in this context, the continued realisation of the major BRICS economic initiatives such as enhanced cooperation in e-commerce, "single window", IPR cooperation, trade promotionand micro, small and medium enterprises (MSMEs).We recognise non-tariff measures (NTMs),services sector, and standardisation and conformity assessments as possible areas of future cooperation.We note in this context the meeting of BRICS Trade Ministers in New Delhi on 13 October 2016 and welcome its substantive outcomes. We commend China for the successful hosting of the 11th G20 Leaders' Summit in Hangzhou and its focus on innovation, structural reform and development as drivers of medium and long term economic growth. We recognise the role of G20 as the premier forum for international and financial cooperation and emphasise the importance of the implementationof the outcomes of G20 Hangzhou Summit, that we believe will foster strong, sustainable, balanced and inclusive growth and will contribute to improved global economic governance and enhance the role of developing countries. To address the threat of chemical and biological terrorism, we support and emphasise the need for launching multilateral negotiations on an international convention for the suppression of acts of chemical and biological terrorism, including at the Conference on Disarmament.In this context, we welcome India's offer to host a Conference in 2018 aimed at strengthening international resolve in facing the challenge of the WMD-Terrorism nexus. We acknowledge that international terrorism, especially the Islamic State in Iraq and the Levant (ISIL, also known as Daesh) and affiliated terrorist groups and individuals, constitute a global and unprecedented threat to international peace and security. Stressing UN's central role in coordinating multilateral approaches against terrorism, we urge all nations to undertake effective implementation of relevant UN Security Council Resolutions, and reaffirm our commitment on increasing the effectiveness of the UN counter terrorism framework.We call upon all nations to work together to expedite the adoption of the Comprehensive Convention on International Terrorism (CCIT) in the UN General Assembly without any further delay. We recall the responsibility of all States to prevent terrorist actions from their territories. We note that BRICS countries face challenges of communicable diseases including HIV and Tuberculosis. We, in this regard, note the efforts made by BRICS Health Ministers to achieve the 90-90-90 HIV treatment target by 2020. We underline the imperative to advance cooperation and action on HIV and TB in the BRICS countries, including in the production of quality-assured drugs and diagnostics. We welcome the outcomes of the fourth BRICS Education Ministers' meeting held on 30 September 2016 in New Delhi, including the New Delhi Declaration on Education. We stress the importance of education and skills for economic development, and reaffirm the need for universal access to high-quality education. We are satisfied with the progress of the BRICS Network University (BRICSNU) as well as the BRICS University League (BRICSUL), which will commence their programmes in 2017. These two initiatives will facilitate higher education collaboration and partnerships across the BRICS countries. We appreciate the organisation of Young Diplomats' Forum held on 3-6 September 2016 in Kolkata. We also welcome the signing of the Memorandum of Understanding between BRICS Diplomatic Academies to encourage exchange of knowledge and experiences. We welcome the outcomes of the Agriculture Ministers' Meeting, held on 23 September 2016, including the Joint Declaration. We emphasise the importance of ensuring food security, and addressingmalnutrition, eliminating hunger,inequality and poverty through increased agricultural production, productivity, sustainable management of natural resources and trade in agriculture among the BRICS countries. As the world's leading producers of agriculture products and home to large populations, we emphasise the importance of BRICS cooperation in agriculture.We recognize the importance of science-based agriculture and of deploying information and communication technology (ICT). Cognizant of the potential and diversity of youth population in our countries, their needs and aspirations, we welcome the outcomes of the BRICS Youth Summit in Guwahati including, "Guwahati BRICS Youth Summit 2016 Call to Action" that recognise the importance of education, employment, entrepreneurship, and skills training for them to be socially and economically empowered. As home to 43% of the world population and among the fastest urbanising societies, we recognise the multi-dimensional challenges and opportunities of urbanisation. We affirm our engagement in the process that will lead to adoption of a New Urban Agenda by the Conference of the United Nations on Housing and Sustainable Urban Development - Habitat III(Quito, 17-20 October, 2016).We welcome the BRICS Urbanisation Forum, BRICS Friendship Cities Conclave, held in Visakhapatnam on 14-16 September 2016, and in Mumbai on 14-16 April 2016, respectively, which contributed to fostering increased engagements between our cities and stakeholders. We call for enhanced cooperation with regard to strengthening urban governance, making our cities safe and inclusive, improving urban transport, financing of urban infrastructure and building sustainable cities. We note India's initiative on the upcoming BRICS Local Bodies Conference to exchange expertise and best-practices, including in local budgeting. We welcome the forthcoming meeting of the Second BRICS Parliamentary Forum in Geneva on 23 October 2016under the theme of 'BRICS Parliamentary Cooperation on the implementation of the SDGs'. We appreciate the deliberations of the BRICS Women Parliamentarians' Forum in Jaipur on 20-21 August, 2016 and the adoption of Jaipur Declaration, centred on SDGs, that inter alia emphasises the commitment to strengthen parliamentary strategic partnerships on all the three dimensions of sustainable development,fostering gender equality and women empowerment. China, South Africa, Brazil and Russia appreciate India's BRICS Chairpersonship and the good pace of BRICS cooperation agenda.